Maputo — The Mozambican government on Tuesday decreed a national emergency, following the devastation caused by cyclone Idai in the centre of the country. 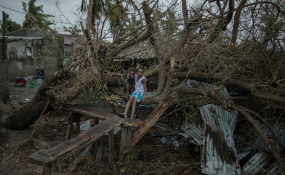 Meeting in Beira, the city worst hit by the cyclone, the Council of Ministers (Cabinet) also decreed three days of national mourning, beginning at zero hours on Wednesday. During this period, the national flag must be flown at half mast. According to updated information given at the meeting by President Filipe Nyusi, the known death toll from the cyclone and the ensuing floods now stands at 202, up from 84 on Monday. These are confirmed deaths, and since many of the flood stricken areas are still without communication, the death toll is almost certain to continue rising. 141 of the deaths were in Sofala province, where 1,385 people were also injured in the disaster. Nyusi put the number of people still at risk in the affected areas at 350,000. The cyclone also destroyed 23,000 houses, and damaged 30 health units and 507 classrooms, according to the figures so far available. More rain is on the way. There is a system of high pressure over Sofala and Manica provinces, expected to bring further heavy rains over the next two days. The rain could be in excess of 150 millimetres falling in 24 hours, accompanied by gusts of wind of up to 60 kilometres an hour. "This will worsen the current situation and raise the level of the rivers in the centre of the country", warned a government statement issued at the meeting. All the main river basins in Sofala - the Zambezi, the Pungoe, the Buzi and the Save - are already on flood alert, and flooding could worsen, particularly in the Pungoe and Buzi valleys. Cyclone Idai dropped much of its water, not in Mozambique, but in Zimbabwe - and this water has now flowed back into Mozambique along the river valleys, adding to the misery of the areas already hit by the cyclone. In the town of Buzi, many residents took refuge on rooftops or in trees, awaiting rescue by boat or helicopter. Nyusi told the meeting that the priority of the moment is to save lives. He gave instructions to ensure that the accommodation centres set up to shelter flood victims are adequately supplied with food, drinking water and medical care. The disaster has forced a postponement of plenary sessions of the Mozambican parliament, the Assembly of the Republic. On Tuesday, the spokesperson for the Assembly's governing board, its Standing Commission, Mateus Katupha, announced that deputies from the central provinces intend to tour their constituencies to see the scale of the cyclone and flood damage for themselves. The Commission, Katupha said, had therefore decided to suspend the plenary sessions that should have occurred on Wednesday and Thursday. This could have a damaging effect on the Assembly's agenda, since it is fighting against time to pass a series of complex bills on decentralisation, which are needed in order to hold the general elections scheduled for 15 October.